Alates of Cryptomyzus alboapicalis (see second picture above) have a dark brown dorsal abdominal patch, deeply indented along the sides. 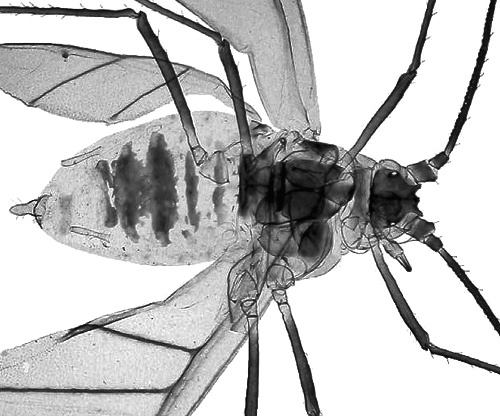 The micrographs of Cryptomyzus alboapicalis below are (1) a lateral view of an aptera and (2) a dorsal view of an alate, both in alcohol. 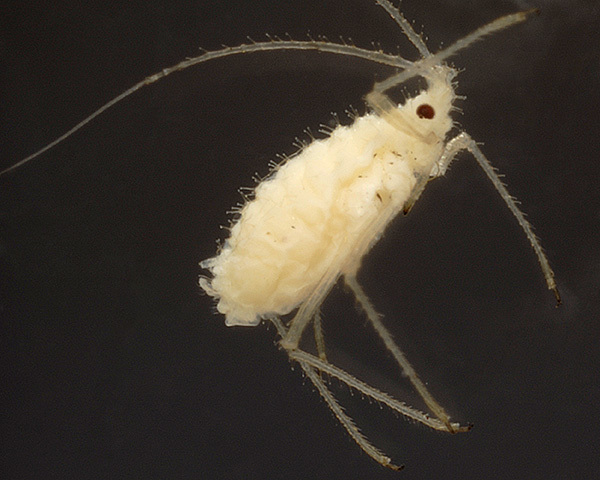 The clarified slide mounts below are of an adult viviparous female Cryptomyzus alboapicalis : wingless, and winged. 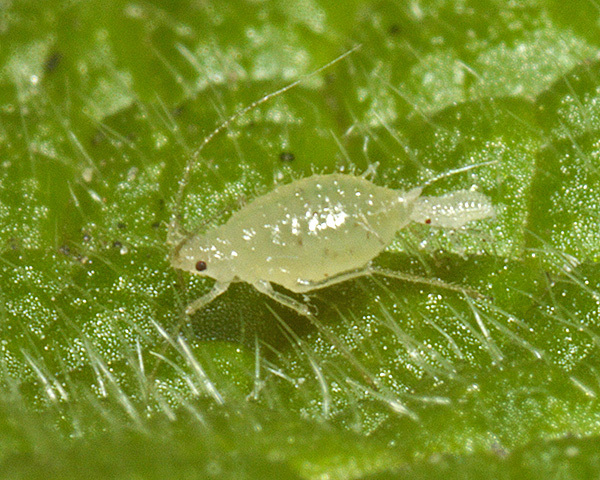 We have found that in Britain Cryptomyzus alboapicalis is always present on white dead nettle from very early in the year, usually from February / March onwards. 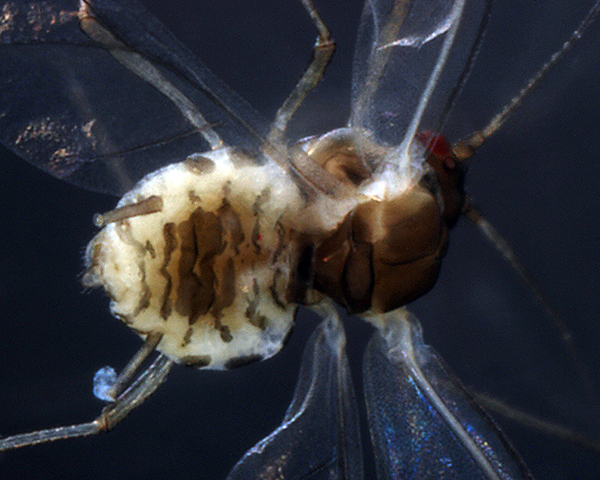 The pictures below show adult apterae in March 2015, one of which was depositing nymphs. 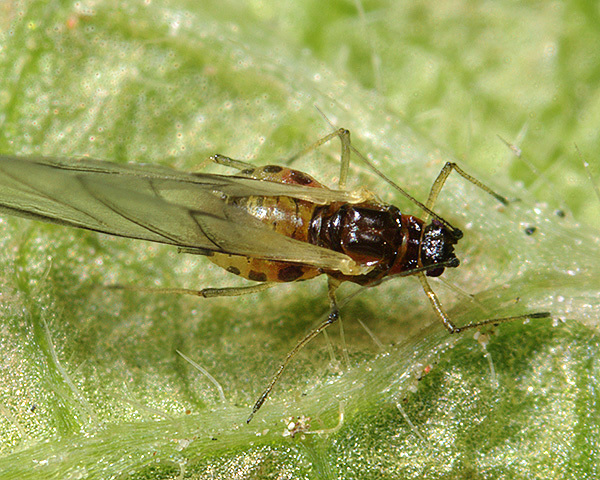 We cannot say for certain whether these adult apterae were derived from eggs laid in autumn by sexual forms or from overwintering viviparae, but it seems likely that in mild winters part of the populations overwinters as viviparae. 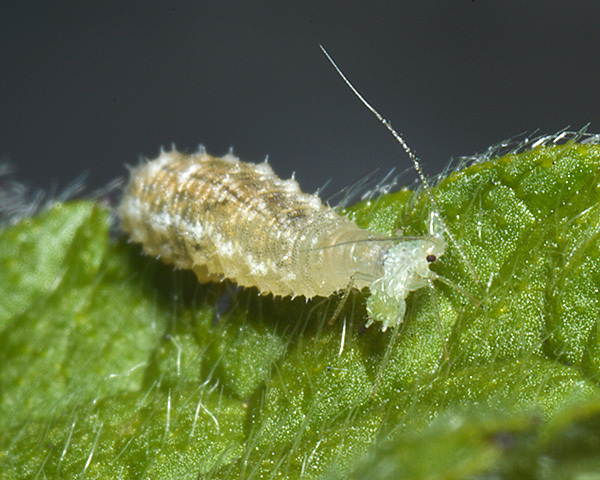 The early population peak enables the aphids to avoid predator and parasitoid pressures later in the season. 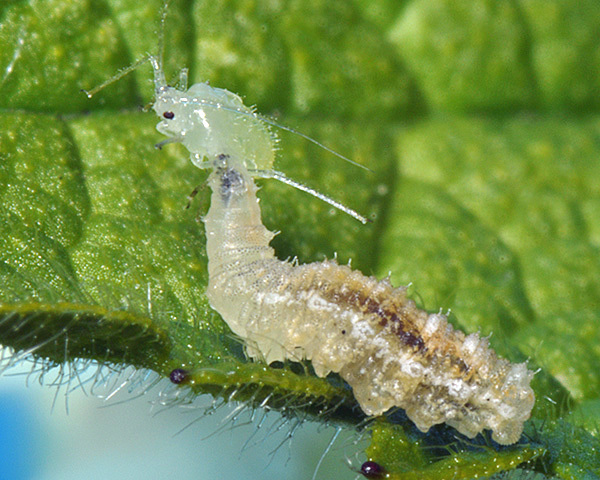 The images below show a syrphid larva predating Cryptomyzus alboapicalis later that year, in May. Guldemond (1990a) studied the evolution of host plant relationships and life cycles of Cryptomyzus species in Europe. As regards Cryptomyzus alboapicalis he recognised two closely related taxa - one feeding on Lamium album, and the other on Lamium maculatum. 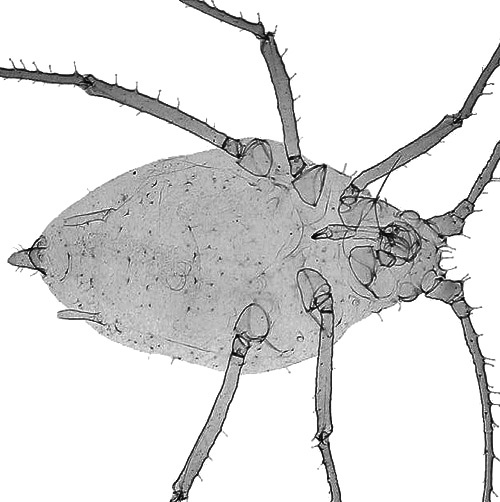 The latter form was subsequently assigned the name of Cryptomyzus ulmeri. Guldemond (1990b) showed that host plant preference of the two taxa promoted their reproductive isolation. Basilova et al. (2008, 2010) analysed the karyotypes of the seven Cryptomyzus species found in Europe. Cluster analysis produced two main clusters: One consisted of Cryptomyzus alboapicalis and Cryptomyzus galeopsidis together with Cryptomyzus leonuri and Cryptomyzus ulmeri. The other comprised only species using Ribes as a winter host, namely Cryptomyzus korschelti, Cryptomyzus maudamanti and Cryptomyzus ribis. Cryptomyzus alboapicalis has been recorded from 4 Lamium species (Lamium album, Lamium amplexicaule, Lamium maculatum, Lamium purpureum). 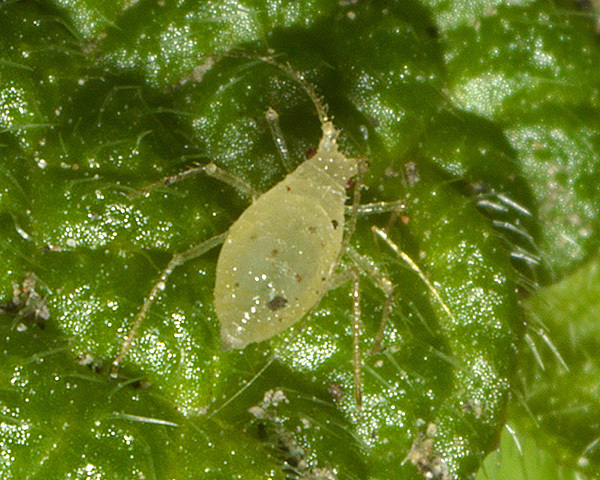 Blackman & Eastop list 24 species of aphid (10 of which are Cryptomyzus) as feeding on white dead nettle (Lamium album) worldwide, and provide formal identification keys. 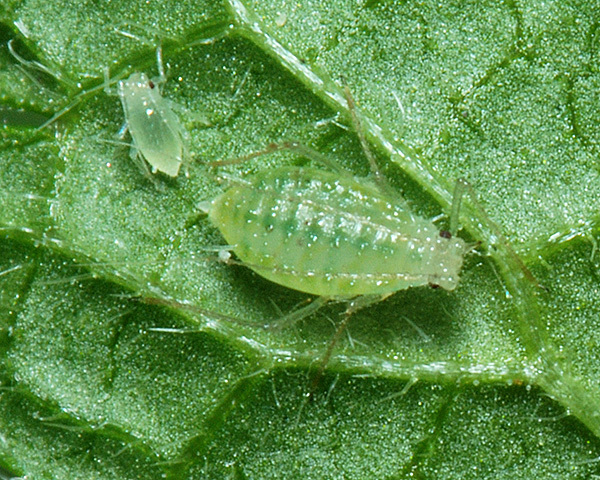 Of those aphid species, Baker (2015) lists 17 as occurring in Britain: Aphis craccivora, Aphis frangulae, Aphis gossypii, Aphis lamiorum, Aulacorthum solani, Brachycaudus helichrysi, Cryptomyzus alboapicalis, Cryptomyzus ballotae, Cryptomyzus galeopsidis, Cryptomyzus korschelti, Cryptomyzus ribis, Macrosiphum euphorbiae, Myzus ascalonicus, Myzus ornatus, Myzus persicae, Rhopalosiphoninus latysiphon, and Rhopalosiphoninus staphyleae.